The Irwell Edition of the Works of Anthony Burgess, published in hardback by Manchester University Press, is a new series which aims to bring all of Burgess’s novels and non-fiction books back into print. Each volume contains an editor’s introduction, a newly edited text, extensive notes and annotations, plus previously unpublished materials drawn from the Burgess archives in Europe and North America. 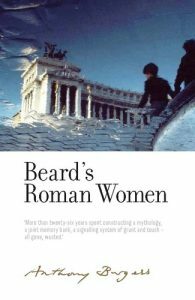 Beard’s Roman Women is inspired by the death of Anthony Burgess’s first wife, and tells the story of a widowed writer moving to Rome to pursue a new love. There, he is haunted by his past, as a mysterious phone call from his supposedly dead wife interrupts his attempts to move on. As with all of Burgess’s novels, music weaves in and out of the narrative, and classical compositions are mixed with popular songs from both the English- and Italian-speaking worlds. Perhaps most surprisingly, Burgess sets a key scene to the music of the American rock band The Grateful Dead, here represented by their 1968 single ‘Dark Star’. The narrative is also punctuated by Christmas carols, though Burgess has written his own satirical lyrics. These lyrics were written while Burgess was living in Brunei in 1958, and were designed to offend the colonial establishment in the country. Included in this playlist are the original versions, though Burgess’s lyrics can be sung alongside by the adventurous reader. This playlist reveals the music that Burgess had in his head when he was writing the novel, and provides an accompaniment to the Irwell Edition of Beard’s Roman Women. The playlist can be accessed here via Spotify (fee account needed).